It’s tough to watch. Your dog used to jump fences and unleash “zoomies” in the back yard. Now, he struggles to get up from laying down. Stairs? Not even in his vocabulary any more. What happened to the dog that used to play for hours on end before needing a water break? The probable culprit – arthritis. Arthritis in dogs is something we see in our practice frequently. In addition, it is something we get great results with. Why is this? Read on to find out. Experts believe that arthritis is a combination of chronic inflammation in conjunction with abnormal loading of a joint. In theory, a misaligned joint places asymmetrical pressure on a joint and initiates an inflammatory response. If this inflammation persists over time (which occurs when a dog is chronically inflamed) the joint can break down. This contributes to the development of arthritis in dogs as well as other animals, including humans. 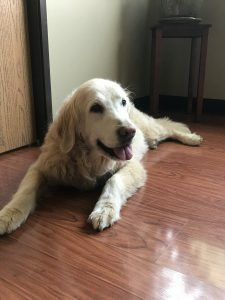 How does animal chiropractic relieve arthritis in dogs? Animal chiropractors are trained to examine dogs for joint abnormalities. When they find an abnormality, they make a very gentle thrust to restore its normal motion and alignment. This flushes out the local inflammation in addition to correcting any abnormal stress placed upon the joint. With the problem corrected, the joint can function optimally and arthritis is less apt to develop. In addition, dogs that already suffer with arthritis will benefit from the increased motion and decreased inflammation. This contributes to better hind end strength, better movement, and more energy. What results should you expect with animal chiropractic? In practice, we are very successful treating dogs who suffer with arthritis. Often times, owners report improvement within 24-48 hours after the initial adjustment. While this isn’t always the case, dogs typically respond quickly to care – so the pet’s owner and the chiropractor will know if the treatment is effective relatively soon. Want to learn more about animal chiropractic? You can contact us here or visit our facebook page where we have plenty of before and after videos for your enjoyment.